Okay it's been a few months and I found some time to finish the boxes (minus the finish) and drop the drivers into their new homes. I put about 2" of fiberglass insulation on the back, sides, and top of the cabinet, which I didn't take pictures of, but it's in there. 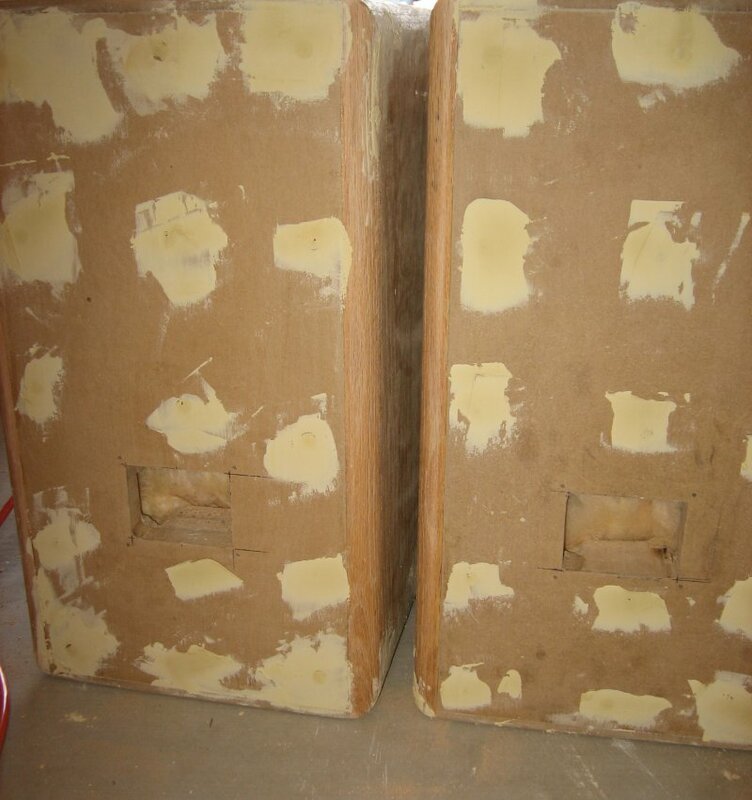 I've always liked using just plain old fiberglass insulation in my boxes because it's inexpensive, has excellent acoustic properties and provides plenty of sound damping. I built up the crossovers by simply twisting all the ends together as shown in the schematic. I ran a set of wires out the ports to test the speakers and still be able to tweak the crossovers. If anything the wires coming out of the port might de-tune the box by a small fraction but it won't impact how the crossover sounds as I tweak around a bit. 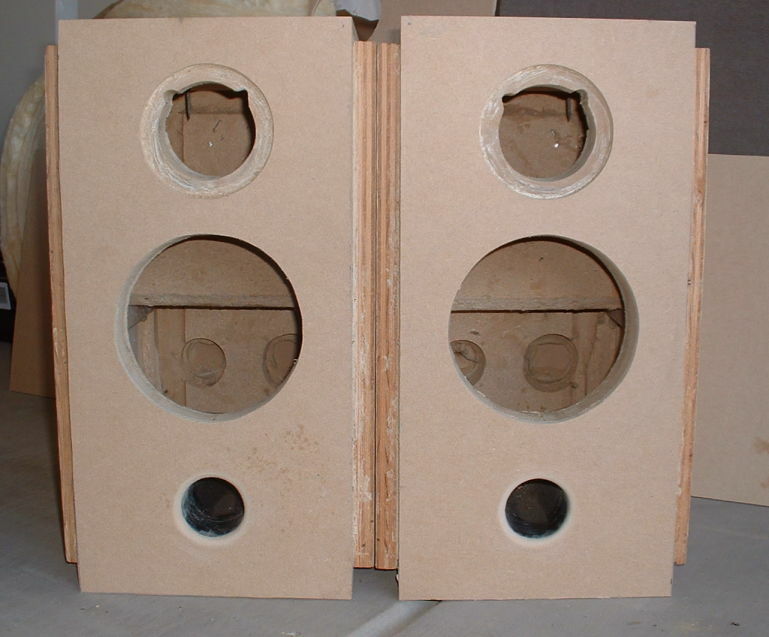 As always this is the most exciting part about building your own speakers, getting to listen to them for the first time. I threw on a few CD's (the only few I could find since most of my CD's are in boxes or lost at the moment) which ranged from Harry Connick, Jr., Lisa Loeb, Coldplay and Ben Folds to Alphaville, The Beautiful South, Electronic and Green Day. So the big question - how do they sound? 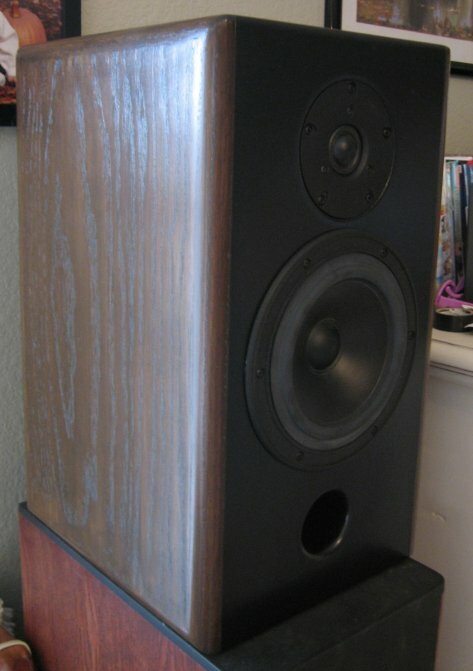 Well with them sitting on top of my Swams M3 speakers, in the same room that I've listened to countless other CD's, I have a pretty good frame of reference as to what sounds really good in that room. So right off I notice that I'm definitely not listening to my Swans M3 speakers. The bass just isn't there and the highs are quite a bit more mellowed out (that ribbon tweeter on thos M3's is amazing) but is typical of soft domes and the bass is what you would expect from a single 6.5" woofer in a 0.5 ft^3 box. So direct-comparing with my Swans aside, they sound very, very nice. The vocals sound clean, the midrange is warm, the highs aren't bright and tinny, but soft and subtle, but still there. I can clearly hear the ride cymbal dancing away on many songs. There isn't any harshness in the sound coming out of the woofer, the crossover is obviously doing a great job of blocking that nasty hump at 3K. 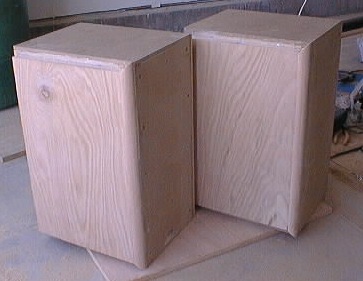 And compared to how these woofers sounded without a crossover, they sound really, really good. There's a good blend between the woofer and tweeter, I think the L-pad values are right on. I wouldn't want the tweeter any louder or softer at this point. But different songs have different amounts of treble, so I could see myself possibly making the tweeter a dB louder later on. The sound stage is great however, with the music fulfilling an area that sounds quite a bit larger than the area occupied by just the speakers themselves. The sweet spot is much wider than with my Swans M3 speakers. Just sitting anywhere between the speakers is enough to create a decent sound stage that appears to extend beyond the wall that the speakers are sitting in front of. To me, that's my favorite part. And a lot of that has to do with the crossover, creating the right sound stage and presence by picking the right crossover points and the right type of crossover (6dB vs. 24dB etc.). In my case I'm using a very simple 12dB/octave crossover with very few components that have been optimized to higher order crossover target functions using software (PCD). This is actually the first time I've done such a speaker, and so far I believe in it 100%. The speakers feel like they sound exactly how the FR response of the speakers looked in the graphs. Now what I'd like to do is take the speakers outside and run some sine wave tones through them and measure the response with my SPL meter. Then I can plot it and see how the speakers look on paper compared to my predicted response. Not that that really matters, I mean if they sounds good then great, but it's still fun to have actual data to compare to. One thing to note about the cabinets is that they don't vibrate at all. 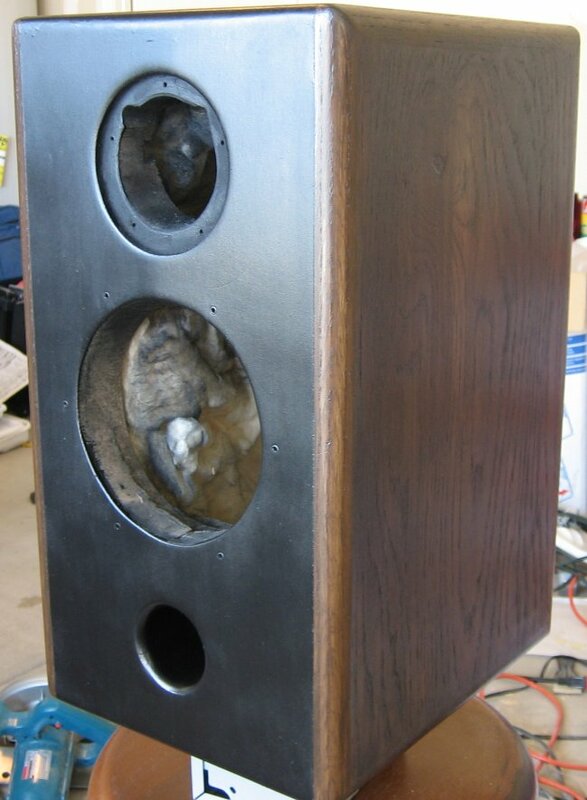 With that little woofer pounding away, the cabinet is rock solid, and that I like a lot. Of course to really tell what these speakers sound like will take some time as the drivers need some break-in time, but so far I'm very happy. 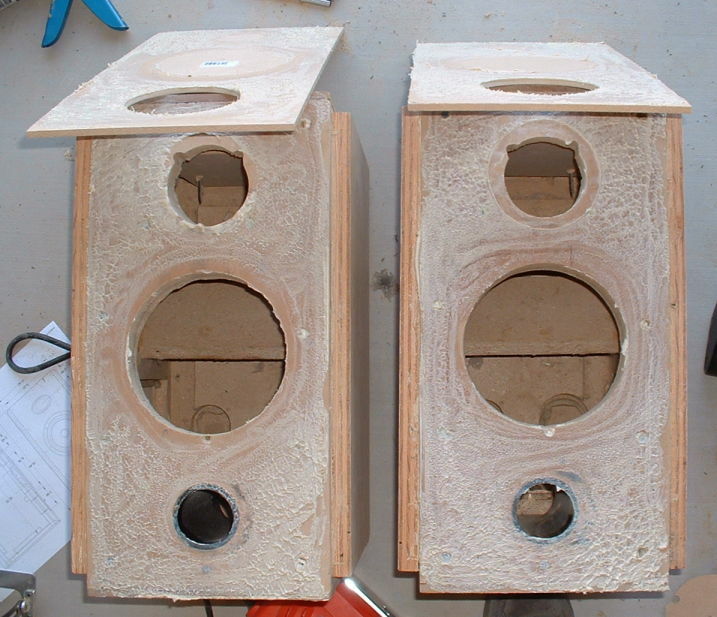 So I'll update this page as I continue to listen to these speakers and finish the finish on them as well. In the meantime, please scroll down to see all the pictures of this work-in-progress. After being shelved for the last 4 years, this project is back in full swing! 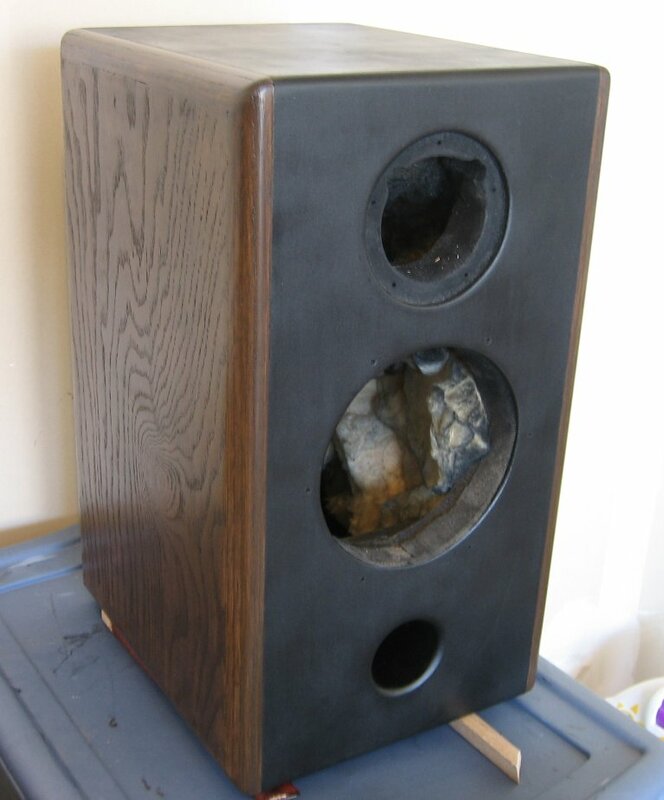 I found the woofers in the garage collecting dust and the half-built boxes covered in oil stains and who knows what else. But after being out of the speaker-building thing for a while, I'm finally going to finish up one of the projects I've had on my mind for a while. 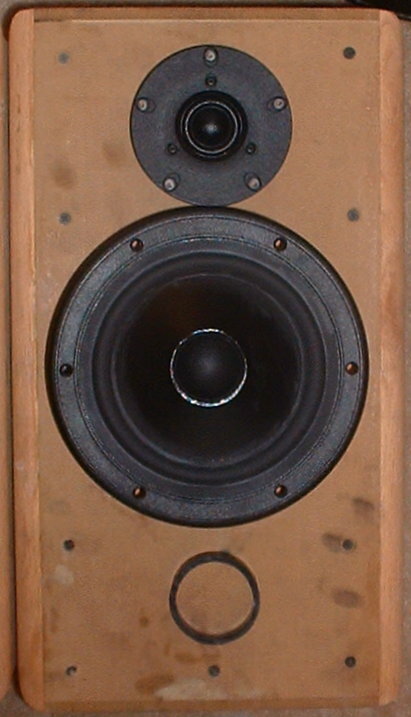 One of the major components changed after Focal discontinued the tweeter I had intended on using for which the original crossover was designed. 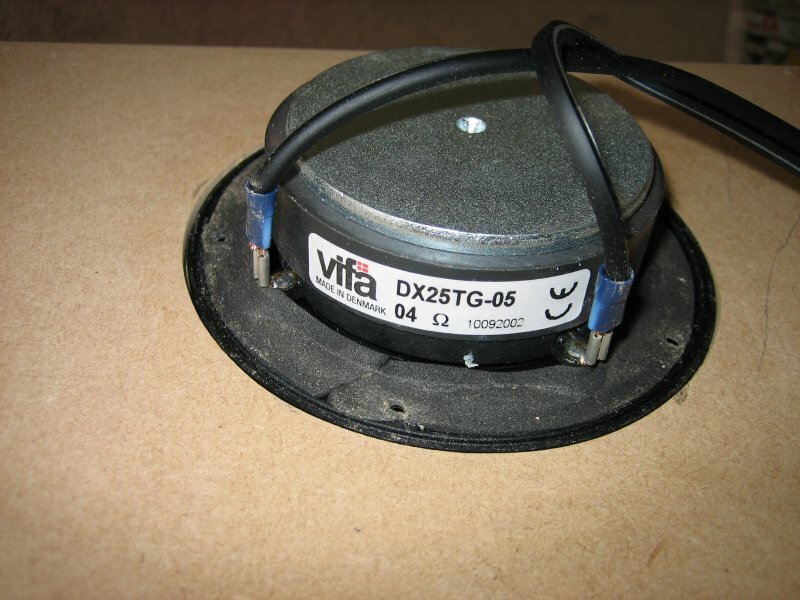 So in a crunch I picked up a used pair of Vifa DX25TG's from a guy I met on the Madisound discussion board. These probably aren't as good as the Focal's would have been, considering their cost, but I thought they were a good-looking tweeter nonetheless. I especially like the over-sized surround on the tweeter's dome as well as the thick 5-hole faceplate. The FR plots look really good on and off axis and should be at least as good as the Hi-Vi W6's. Well with the new tweeter, the old crossover had to go. 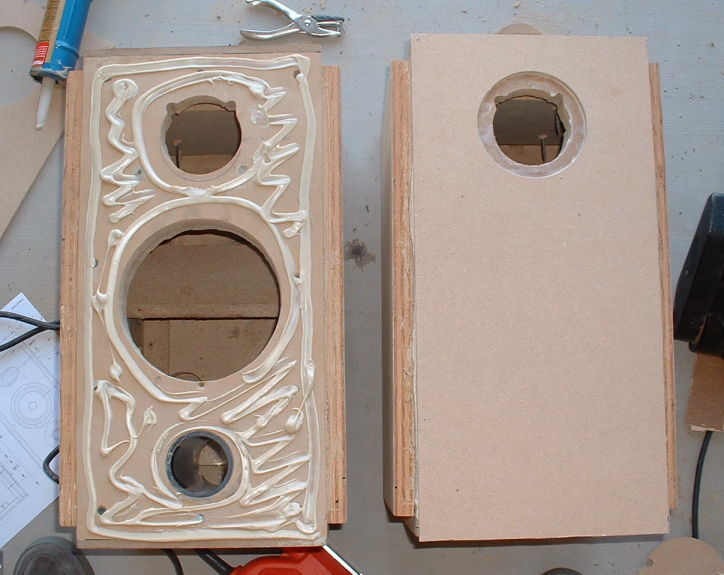 I've learned a few things since the last time I built a pair of speakers - like how to design a custom-tailored crossover specifically designed to match mydrivers. No more textbook x-overs for me! I was recently turned onto two programs that I feel every DIY'er should never be without and they are offered for free by the guys over at FRD Consortium. Now these guys have LOTS of great programs that model crossovers to subwoofer enclosures to baffle diffraction simulators and a lot of stuff in between. I highly recommend checking them and downloading whatever you've got time to mess around with. The two programs that I particularly love for crossover design is SPL Tools (tracer/viewer) and PCD (passive crossover designer). These two tools take some of the guesswork out of crossover design by allowing you to use actual manufacture's frequency and impedance plots to create crossovers designed to work with your drivers. SPL Tools allows you to create tabulated data of frequency response and impedance curves from a picture (like a .jpg or .gif file) which can then be imported into PCD. 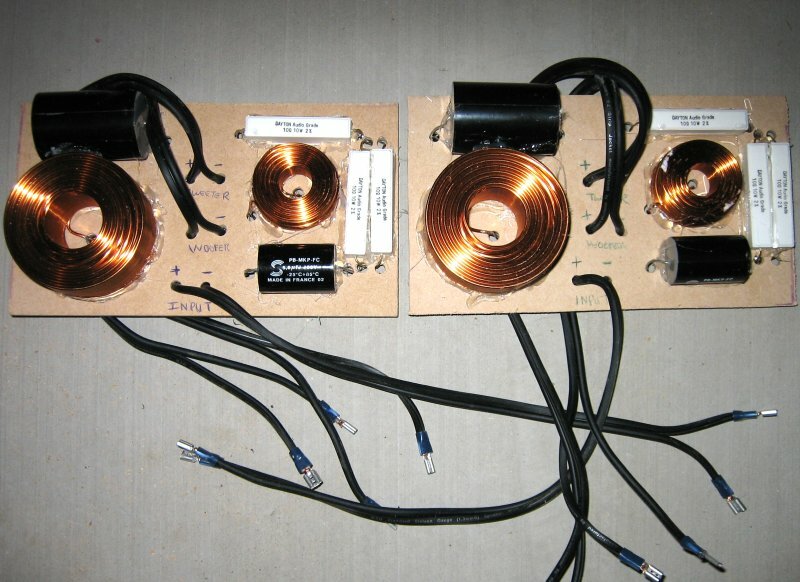 PCD is then used to build your crossover by simulating different crossover frequencies and different types of crossovers (Butterworth, L-R, 6dB, 12dB, etc.). I've never used anything so cool! You can also compare textbook crossovers with your own and see exactly how it affects the frequency response of your system. It gives you a real-world picture of why textbook crossovers usually sound inferior to something that's been tailored exactly for the speakers. So the first thing I had to do was generate .frd and .zma files from the pictures I had of the response and impedance curves of both drivers. Using SPL trace, this is a somewhat tedious task, but after a few stabs at it you can quickly type your way through both curves. After fiddling around with PCD for a few weeks, I narrowed down a crossover that gave me the flattest response across the band while using the fewest amount of components. The low pass utilizes a 12dB/octave electrical circuit with 3rd order target functions at a frequency of 2kHz. 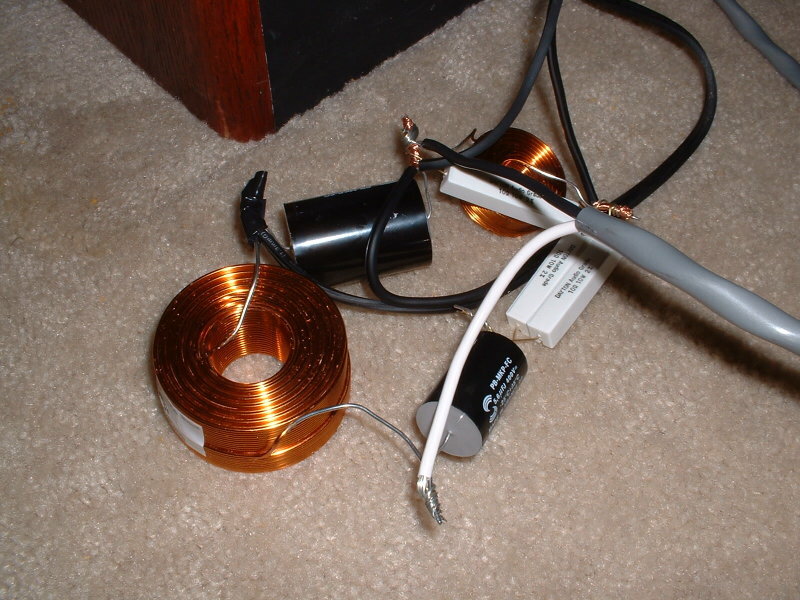 This is achieved using a series 1.8mH inductor and a parallel 18uF capacitor. I also tried some Zobel networks but found them to not be needed. The high pass also utilizes a 12dB/octave electrical circuit with 4th order L-R target functions at 2kHz. 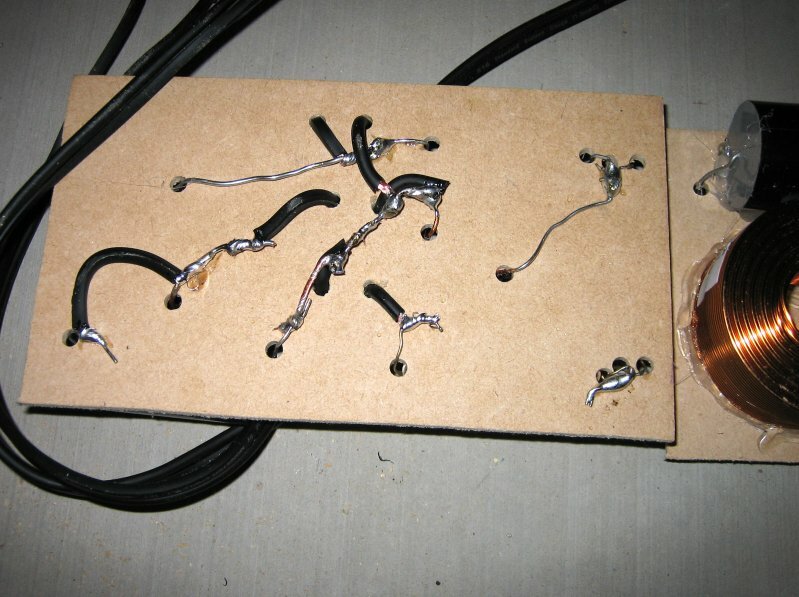 This is achieved with a series 5.6uF capacitor and shunt 0.50mH inductor. Lastly in order to compensate for the extra efficiency of the tweeter, I've added a 5 ohm series resistor and 10 ohm shunt resistor across the tweeter. Since the tweeter is nominally 4 ohms, this L-pad brings the nominal impedance to around 7.85 ohms which should be much more suitable for any amplifier and better match the impedance of the woofer. Now these aren't the only values that worked to achieve a nice flat response. PCD allows you to dial up or down capacitor and inductor values and watch in real time how it affects the response. This is a really cool feature because it lets you play around with the values and experiment with slightly different response curves. Just a few days ago I ran across Dave's Speaker site at www.speakerdesign.net. He's got lots of information on his site including raw driver measurements he tested of several popular woofers and tweeters using CALSOD. After perusing through his site a bit, I found my tweeter amongst the few that he had tested. And he had an FR plot that I could download of the actual tweeter! So instead of relying on the manufactures data, and my rough data file created with SPL Trace, I could import actual data and tweak my crossover accordingly. So the first thing I did, without changing anything in my crossover design, was to simply import the new .frd file in place of my old one and see what the same crossover looked like with the "actual" FR data from the tweeter. Granted I'm still relying on my SPL Trace data for the woofer, believe it or not the crossover still looked near perfect! A testament to SPL Trace, CALSOD, and PCD for developing accurate and predictable tools for guys like me. So with the new FR data from the tweeter loaded, I tweaked a few more values and got the summed response to clean up just a bit. Then I reloaded the old FR data to see the affect and again, it was very minimal. Since I'm really only relying on simulated responses, I'm still going to need the ability to tweak the system when I get everything up and running. The biggest adjustments I could see that I may need to make will be in the L-Pad and the series capacitor for the tweeter. The low pass section might could use some tweaking on the parallel capacitor, but otherwise both my inductors are going to be fixed and shouldn't need to change. I love tweaking caps for two reasons: one because they are so easy to tweak. Why? Because caps add in parallel. They make for excellent AB comparisons by simply allowing the second (or third) cap to float and then connecting it into the circuit with a either a switch of just by connecting it up. There's no break in the sound, and you can go back and forth all you like listening to the difference the change in capacitance makes. And two, is because it's very inexpensive to buy just a few capacitor values which still give you a wide range of actual capacitor options. Inductors just aren't quite as easy to calculate (1/L1+1/L2=1/L3), or add into the circuit on-the-fly, and they are more expensive. So I bought 5.6uF, 6.2uF and 1uF caps in order to achieve 4 different crossover values: 5.6uF, 6.2uF, 5.6uF and 7.2uF. I could also add either of the 5.6uF or 6.2uF caps in parallel with my 18uF cap with my woofer to achieve even more roll-off if needed. I modeled each of these possible combinations and they all potentially could sound fine, however the proof is in the pudding, and I'll need to listen to them to determine which one sounds the best. I can't really say why I started this project. Especially why I started it and might even finish it before I even finish my Swans M3's. 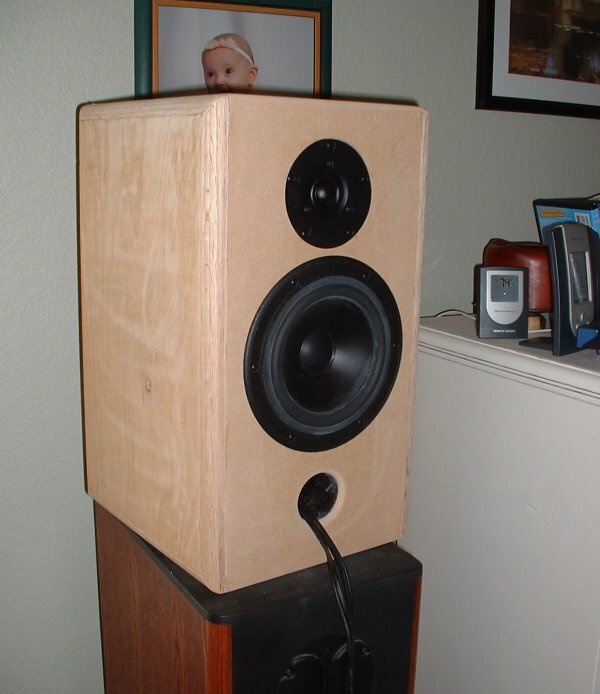 I started out wanting to build an awesome pair of tower speakers for my home theater. I hadn't built a really good pair of full range speakers lately and wanted to try my hand at something a little bit different. Well as opposed to just building subwoofers. It wasn't until Parts Express had a factory buyout on all Hi-Vi Research drivers that I thought I'd give those drivers a shot. 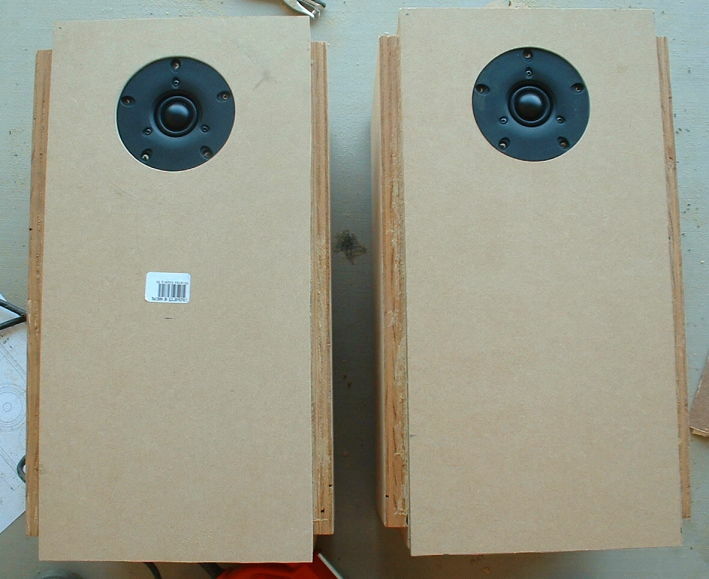 One of my biggest fears to designing and building full range speaker systems is the crossover. I don't have the equipment, or the software to do extensive driver modeling and testing. 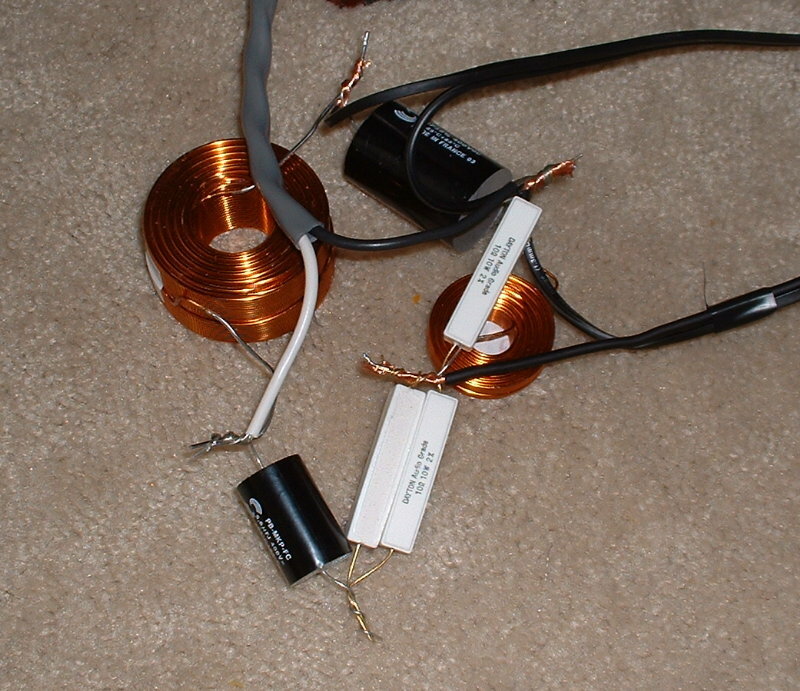 And since the crossover can either make or break your speaker system, if you don't have the tools, you're best bet is to not even bother making the project. Now granted I have built a number of two-way systems, but the crossover is certainly the one thing I'm not proud of. So when Parts Express was offering the original crossovers for a fairly elaborate Swans kit (of which I knew absolutely nothing about), I jumped at the chance to buy them. Well I didn't jump fast enough and buy the time I had ordered up all the drivers to build this kit, the crossovers were all sold out. My worst nightmare confirmed! Not only did I have all these driver bought for a kit I knew nothing about, I was going to have to design the crossover for it now too? Well the design I had, it was the parts I would need to buy. An estimated $85 later would have built me these crossovers as designed by Swans for the M3 kit. And Parts Express had offered them for only $9.95. Well thanks to the PE Discussion Board, I met a guy who was willing to give me the crossovers he'd bought in exchange for a little bit of manual labor on my part. 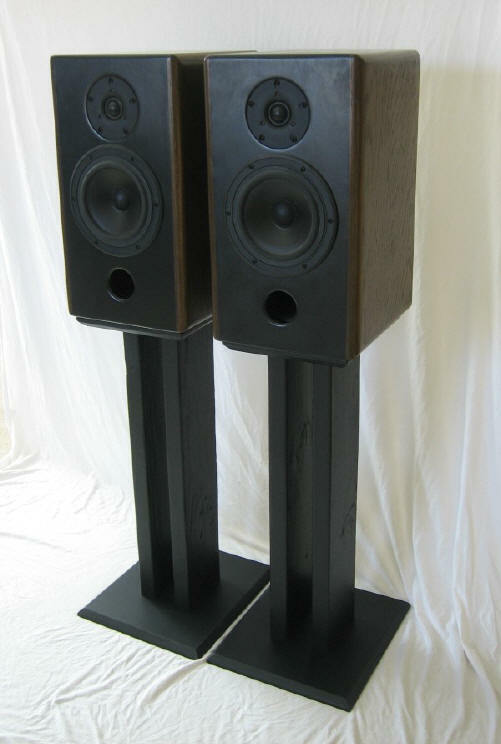 I was more than willing, and a few days later I had a brand new pair of Hi-Vi Research crossovers designed exactly for the Swans M3. 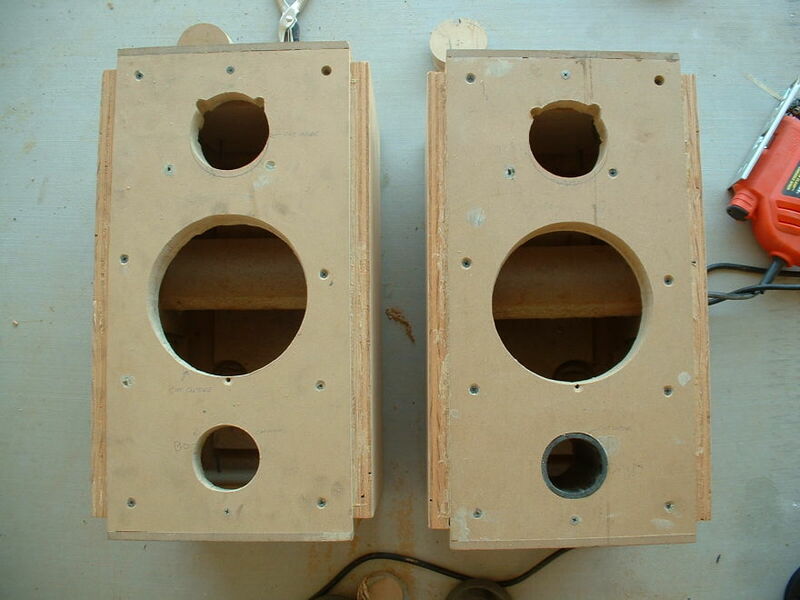 I was on my way to making my awesome pair of speakers. 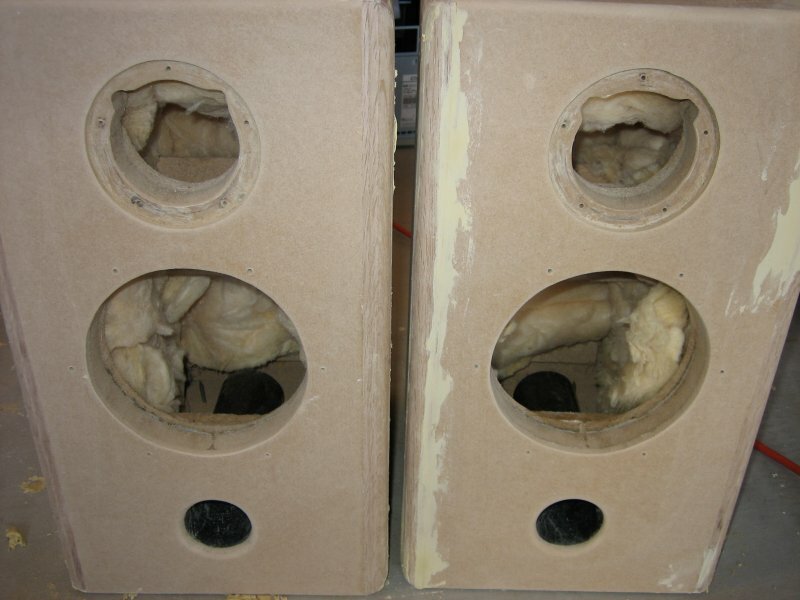 To make a long story short, and to prevent myself from repeating any of this when I compile a page about my Swans M3, I ended up with an extra pair of W6 woofers. Parts Express actually gave me one for free because I was trying to get all of the W6 drivers to match. Aesthetically there were some variations in the surrounds - one was black the others were a charcoal gray. In an attempt to replace one of the drivers, I called PE to get another driver and was sent the same driver I was trying to replace. So Jeff from the PE board sent me a brand new driver FedEx 2nd Day Air. That was it. I ended up with six W6's to which have been sitting in my closet ever since the day I got them all. So I pondered what I should do with the extra two drivers I had, but had no need for, or intentions to do anything with. 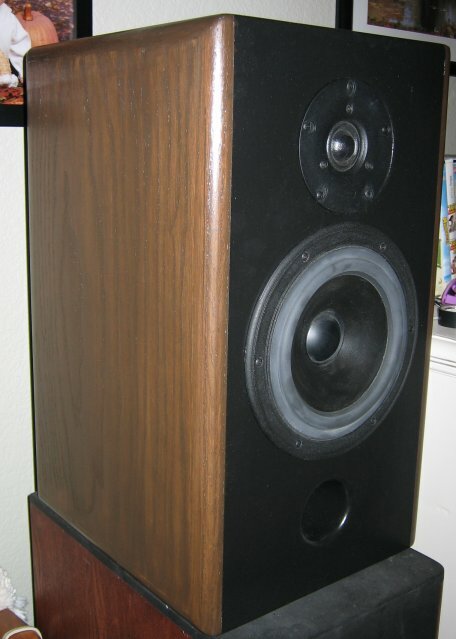 So my wife and I are watching a movie one night, and I'm staring at this old pair of mini-monitor bookshelf 2-way speakers I had built for my wife back when we were dating. 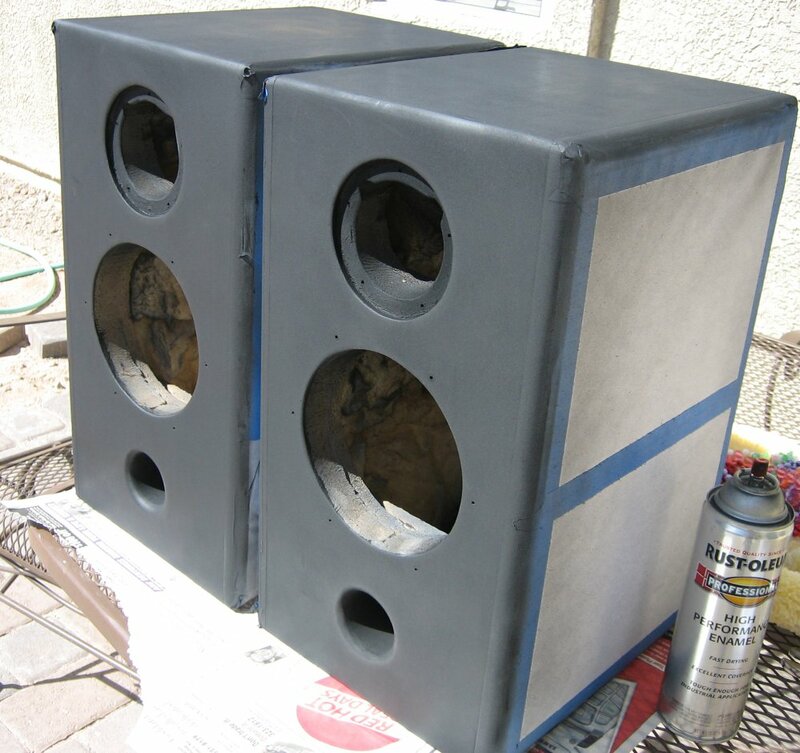 Back then I guess I wanted to show off a little bit so I built her a stereo system, amplifier and all - totally custom. Needless to say the drivers in the speakers I had built her cost around $40.00 total, and the speakers were covered in contact paper. 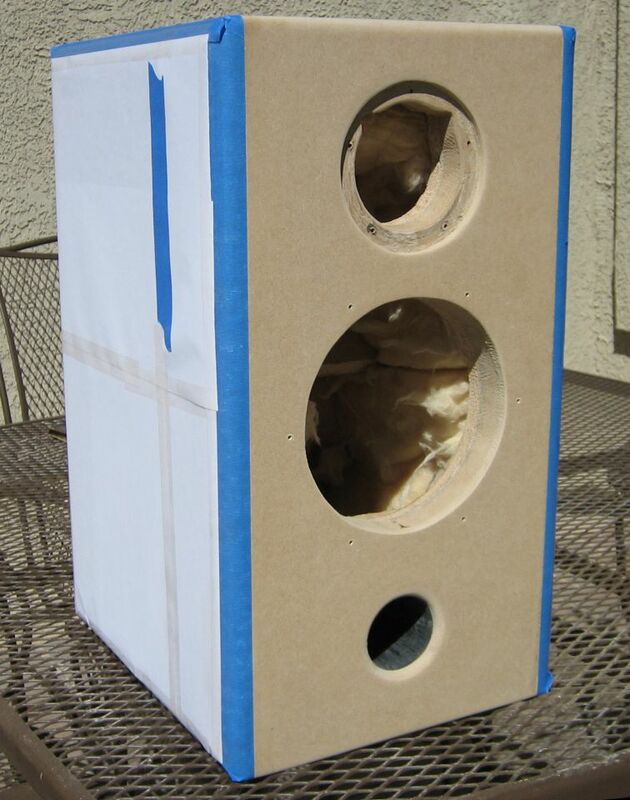 Having built a pair of speakers with contact paper for the finish is like failing a college course and having it show up on your transcript forever. People who came over who knew I was into building speakers saw a plush, prime example of what I do - boxes with contact paper. Not pretty. They looked like the inside of your mother-in-law's cupboards. I obviously couldn't live with that for long. 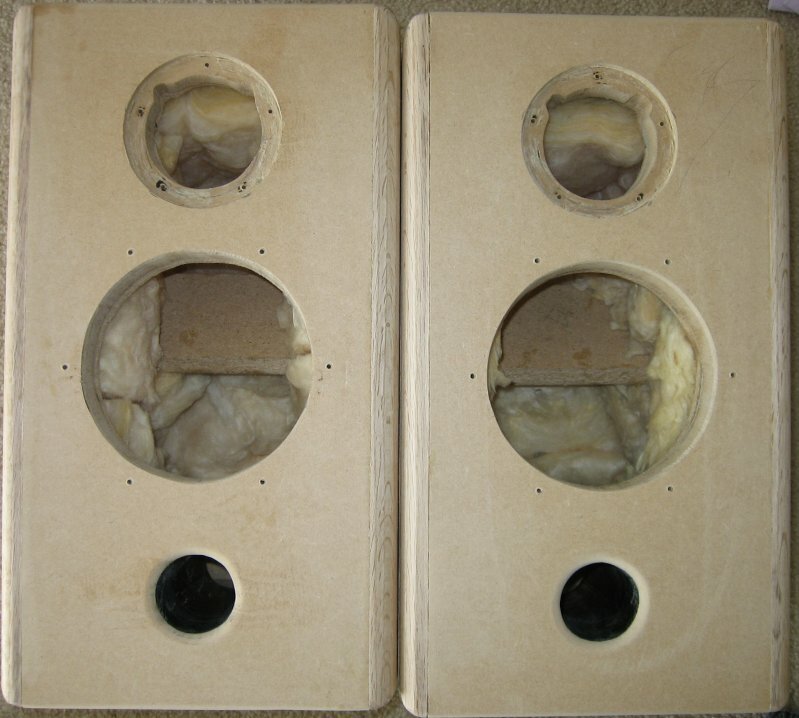 So off I tore the contact paper and out came the drivers exposing a solid and firmly built speaker enclosure. Raw wood and dried up glue. I thought, "This is where I will begin my project." For me I guess it's just easier to jump into a project if it's halfway done before you start. This project seemed almost already done, before I started. Little did I know what I was about to put myself through. 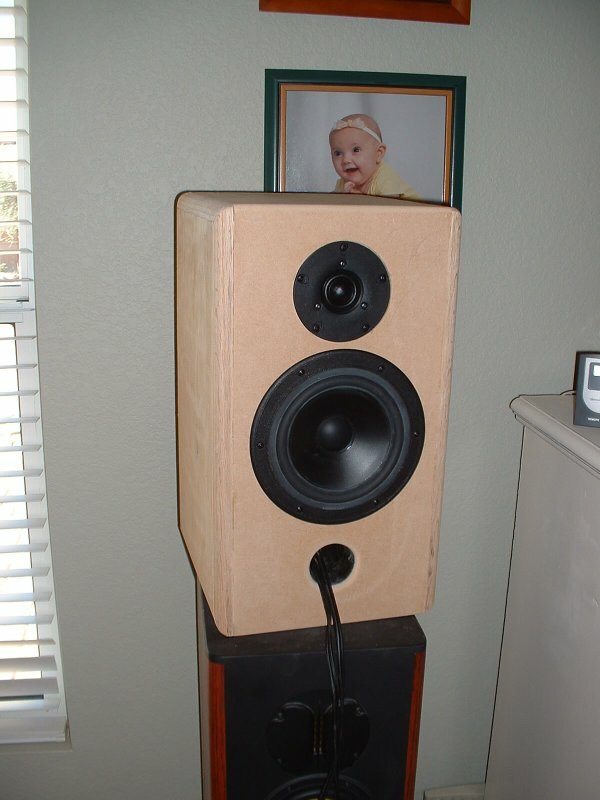 First thing to do with any loudspeaker is to establish your design goals. 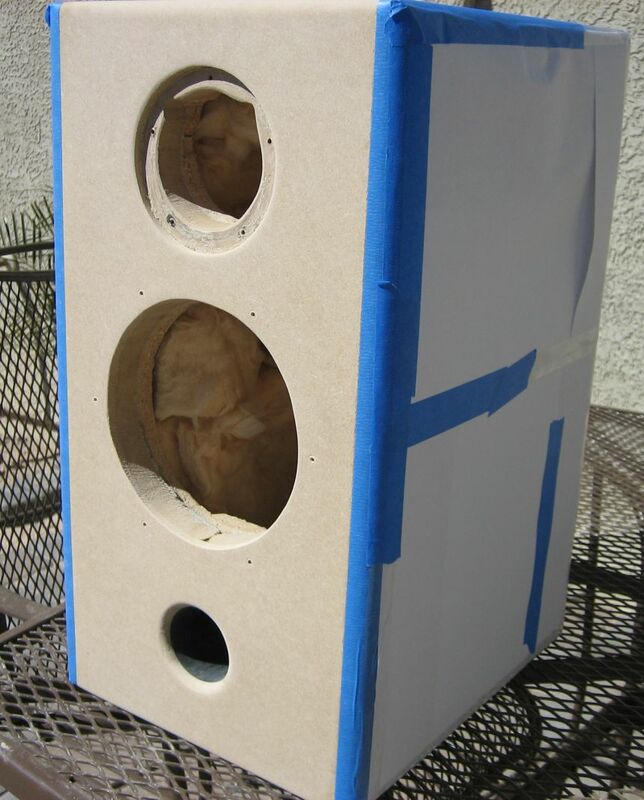 Design goal number one - sonically dead enclosure. So first things first, I had to reinforce all the walls of the enclosure. It was originally made of 5/8" particle board. So on the back I used another smaller piece of 5/8" PB and glued it to the inside of the enclosure making the rear wall 1-1/4" thick. This still wasn't enough, so I added a piece of 3/4" MDF that fit exactly on the outside of the enclosure and finished off the back nicely making the total thickness 2.0". Now when I rap on the back of the enclosure it sounds solid and dead. No excess ringing or resonating and it has a very low very quiet tone. Have you ever tapped your knuckles on a slab of marble? Well, not quite that good. The front I reinforced with another piece of 3/4" MDF and will finish off the front with another piece of 1/4" hardboard. This makes the front baffle 1-5/8" thick. It's not as thick as the rear panel, but I do have 5/8" bracing ribs running from side to side between the two drivers and the port. I will also implement a special bracing technique that I cannot discuss right now. It's still in the works, and is so simple yet should be so effective that I may apply for patent on it. Ah, who am I kidding. I'll just tell everybody and then you all will be doing it too. At any rate, I think it's a cool idea. 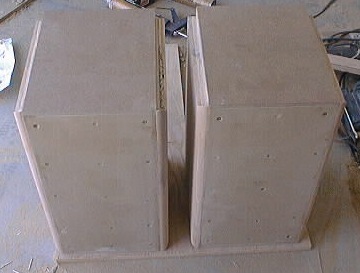 The top and bottom were reinforced with another layer of 5/8" PB and a finishing layer of 1/4" hardboard. That makes the top and bottom 1-1/2" thick. Still not the thinnest part yet. This should be plenty thick as the top and bottom share the least amount of surface area. Tapping on their surfaces results in a very deep, very solid thud-like sound. The hardboard on the top, bottom, and front also serve as a super smooth, super flat, unblemished surface which will be easy to finish with the lacquer. 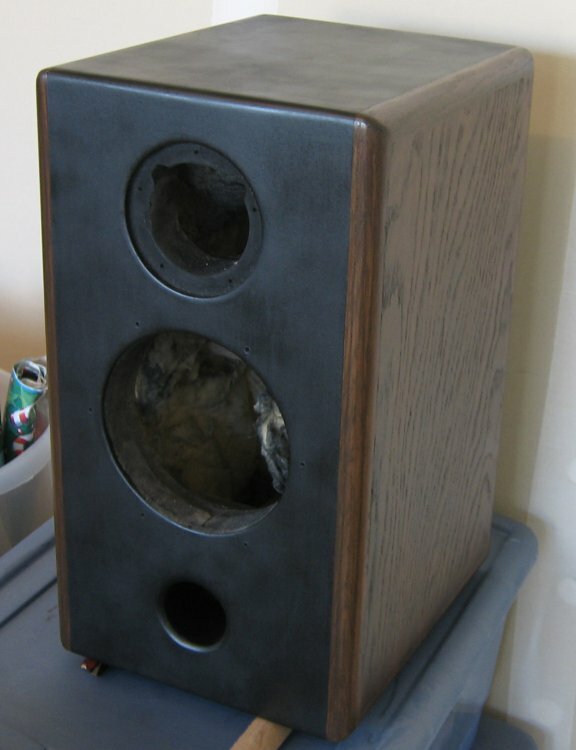 I have finished speakers in the past with a black lacquer, and although I've had good results, the one thing I could never do is get a piece of MDF to be completely flat and completely smooth. 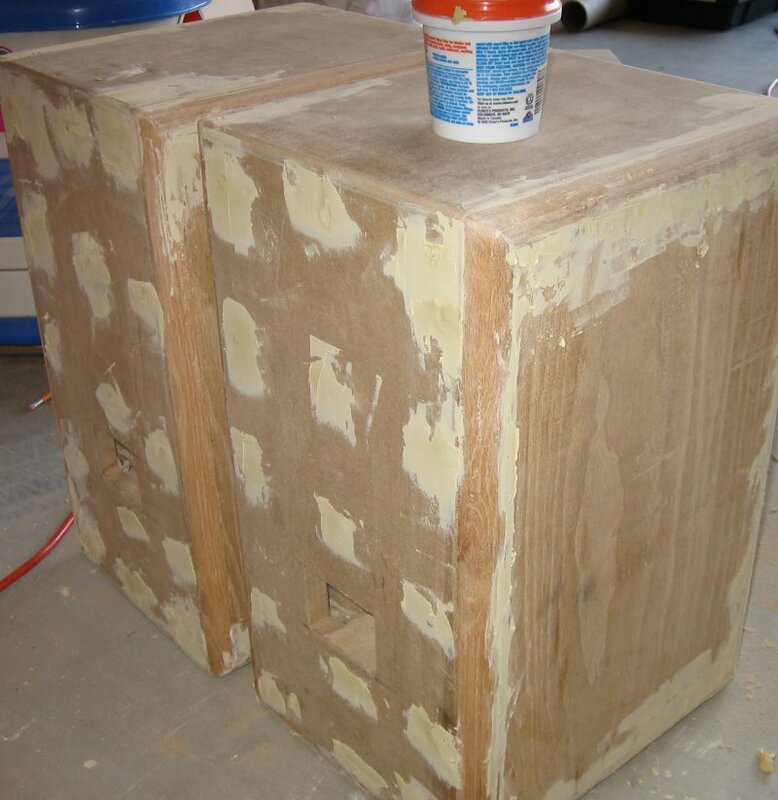 No matter how much sanding you do, the surface will still have a slight unevenness to it. And I mean sanding with 400 grit gets it smooth, but it's still got like waves in it. Subtle, but there. This hardboard wood after its sanded is flat like glass and smooth like silk. That's the kind of base I need under my lacquer. I'm hoping it works out. The real beauty of this speaker system entails this next part. The sides of the enclosure I reinforced with a piece of 3/4" oak plywood. Not solid oak (which may have been ideal, only lots more money), but just a piece of 3/4" oak plywood. The kind that's 1/64th of an inch oak an 63/64ths of an inch some other woods. I glued this piece of wood on each side and made it exactly 3/4" of an inch shorter on every side. This leaves room for the 3/4" solid oak quarter rounds which mate the sides of the enclosure to the front, back, top and bottom. There's nothing like beating diffraction than a perfectly rounded 3/4" edge. There are two reason for doing it this way: first I don't own a router, so making the 3/4" rounded edge would have been a nightmare. And second, purely for aesthetics. 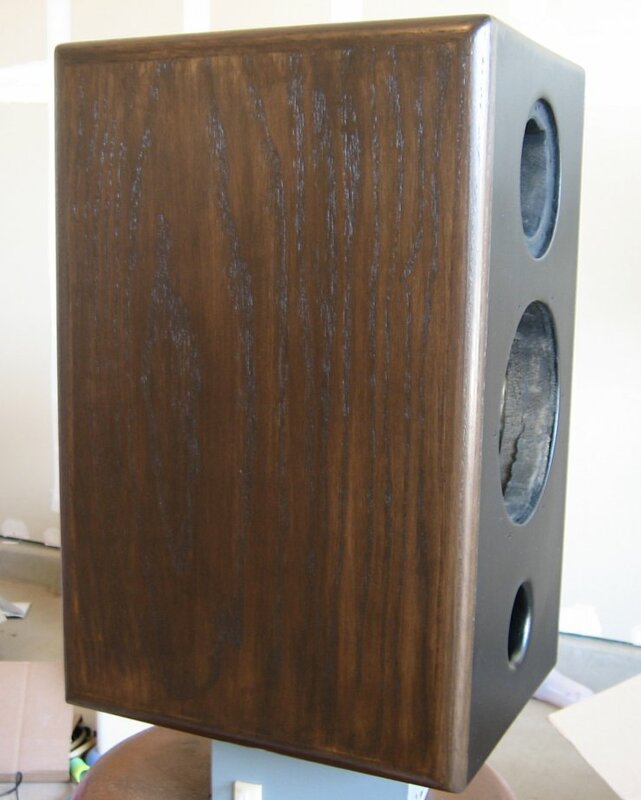 The two different wood styles and grains will produce a very pleasing, very hand crafted sort of look to the speakers. It's more of a carpenter's kind of finish. The alternative would have been to use a solid piece of 3/4" oak and just routed the edges all the way around. For deadening and reduced vibration in the panels, this may have been the superior way to go. Yet I plan on implementing my special bracing technique which should make those walls as impermeable as the Great Wall itself. (China, not Berlin). Besides it was the look I was going for, and the fact I don't have a router. Any way you look at it, I'm making my way the superior way. Wall thickness on sides is 1-3/8". So as the boxes were coming along, I knew I had to get cracking on a crossover. Well actually I had to decide on the tweeter I wanted to use with the W6's. Many might say that the RTC-1 would be the ideal choice. "Stick with the same name brands." Well, I've got a pair of RTC-1's and I've listened to them alone and with the W6. Although it's an outstanding tweeter, and I can't wait to get them all ready to go in my Swans M3's, I just didn't feel that the W6 to RTC-1 was a good match. Mainly because the break-up modes of the W6 begin around 2KHz and rise quite substantially to to 3.6KHz before they trail off. The RTC-1 cannot be crossed over over any lower than 3.3 KHz as recommended by Hi-Vi, so that would forced me to use the W6 way into its breakup mode region. All the while trying to get it to crossover over smoothly into tweeter. It would have been a nightmare. After all is said and done, my wife really hates the way that RTC-1 looks. I don' know why. It's unconventional looking I suppose, but she vetoed it from the start. Well no big deal for me, it just meant I'd have to find another tweeter, preferably one that passes SAF. Can you believe that? 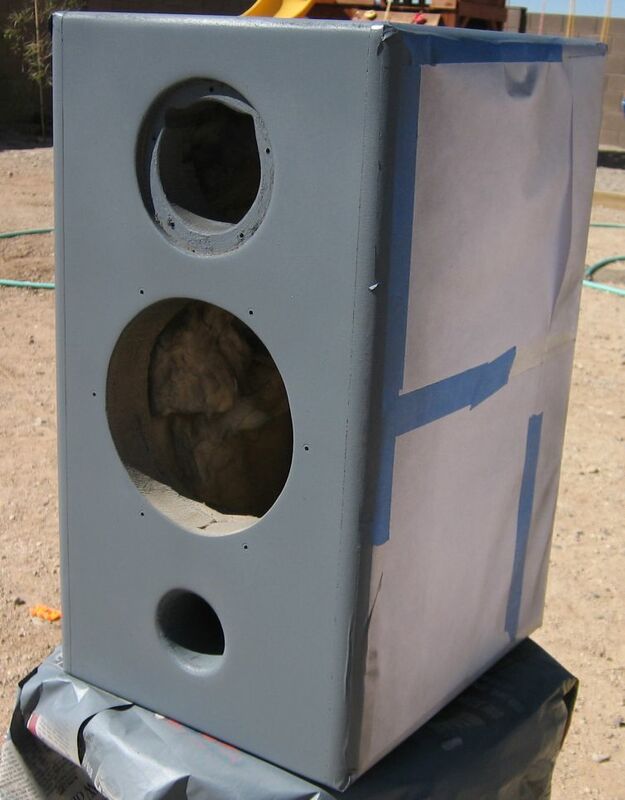 Most guys just have to worry about their speaker boxes not being too big, but now even my tweeters have to pass SAF. At any rate, the search for the "best looking" tweeter became my goal. Well there are a lot of good looking tweeters out there, some cheap and some expensive. 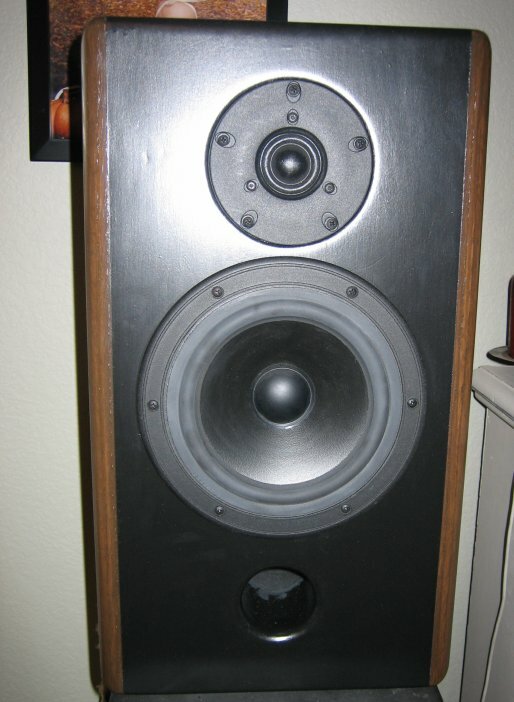 It wasn't until I sat down in front of a pair of JMLabs speakers that I think I had found a winner. As you may know, JMLabs features all Focal drivers, and some dang good looking drivers too! So I sat down for a listen and not only was I blown away by the transparency and overall tonal balance of it all, I knew I had found my "good looking" tweeter. Lucky for me I think it happens to be an awesome sounding tweeter as well. I pulled up all the specs from Focal's web site and studied their top two tweeters. Well they aren't their best tweeters, but c'mon, who can afford a $450.00 tweeter? I settled on the TC90dxB. Mainly because of its lower resonant frequency, apparent flatter frequency response (from the graphs), smaller faceplate (which looks better next to a fairly small W6), and finally, it is less expensive than its bigger brother the TC120dxB. I am also under the impression that the TC90 is better intended for 2-way applications because of its lower resonant frequency thus allowing an overall lower crossover frequency. Remember I have to avoid the break-up modes of my W6 which start around 2KHz. The TC90 with a properly designed high order filter will do the trick just perfectly. Now that I had picked a tweeter, it was time to get cracking on the crossover. 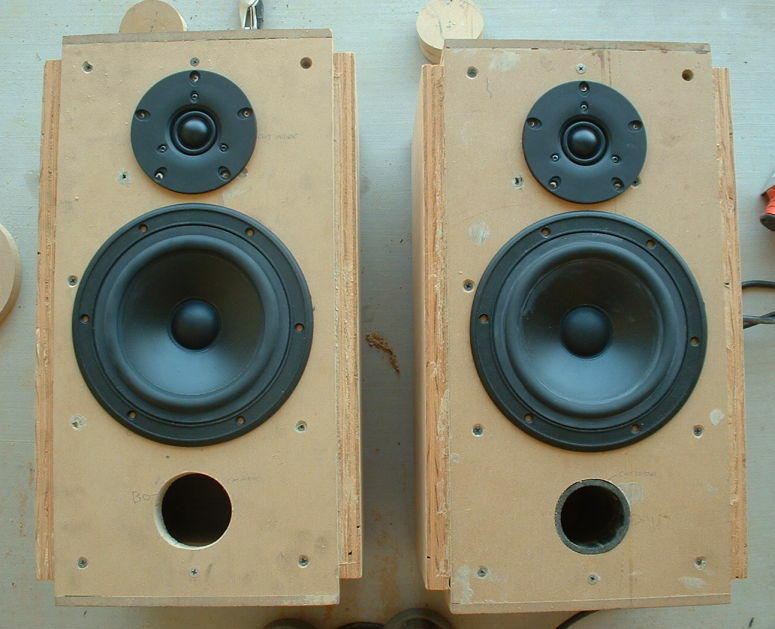 This is where speaker design eludes me. Until I have spent countless hours in front of an expensive software program that I don't even own, I won't even begin to design a proper crossover for a speaker. Sure I can punch in a bunch of numbers into some java script application from some Joe's web site and get filter component values, but this does just about a hill of beans for real world crossover application. Everybody knows that textbook crossovers make one huge assumption about the type of load your going to use at the other end of it, which is so wrong in and of itself. Speakers are not resistors! Speakers are complex circuits which have varying impedances, varying phases, varying SPL, all which change up and down with frequency. A well designed crossover will take into account every aspect of a drivers response and tailors it to perfectly match a desired design criteria. Not only that, but the crossover must also account for baffle step diffraction losses. This was a new theory for me till just a few months ago. There's also interdriver time delay. Say that 10 times real fast. That's when I decided to look to the Madisound discussion board for some friendly advice. Which is how I met Mr. BobM9 who ended up designing the entire crossover for me. Hats off to Bob for helping me out! You don't know how much I appreciate it. He spent a few hours with the SPL and impedance graphs of these drivers acquiring raw useable data to import into LspCAD (which is what I think he used). The program is called SPLTrace (as mentioned above). It allows you take generate useable data from a simple SPL or impedance plot from nothing more than just a picture. You can take manufacturer's measured plots and turn them into real data to be imported into crossover modeling software which can then be used to design a crossover that works exclusively just for your drivers. This plus a little more is what Bob did for me. I guess he and a few other people are still developing the software to do this kind of DIY crossover design. One of which includes a program that calculates for baffle step losses. Although I don't have any real world experience with this theory, this is what I have read, "The essence of it is this: At high frequencies the speaker is radiating into "half space" i.e. it is only radiating into the forward hemisphere. 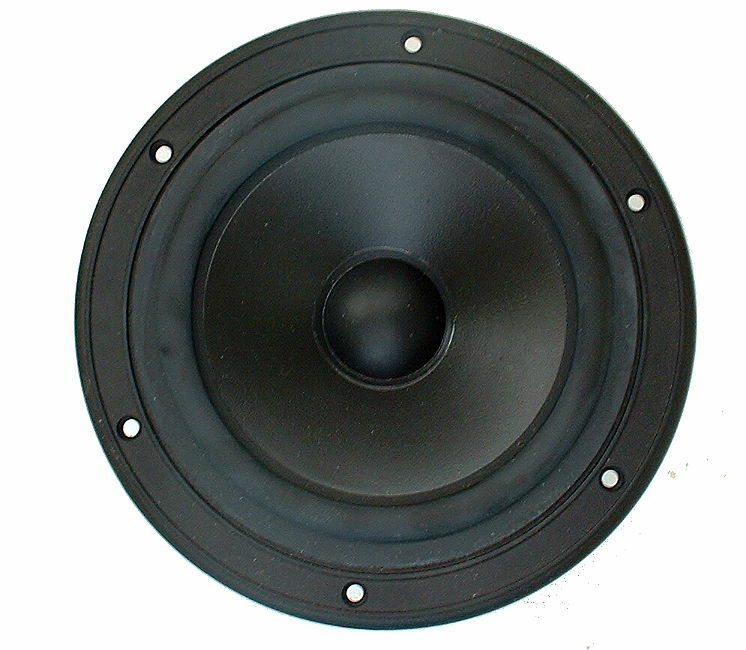 No significant energy is radiated to the rear of the speaker. At low frequencies the speaker is radiating into both the forward hemisphere and the rear hemisphere. That is, at low frequencies the speaker radiates into "full space". Because the "energy density" at low frequencies is reduced, there is a loss of bass. In short, speaker systems designed for radiation into half space (mounted flush on an infinite plane) exhibit a loss of bass when implemented in typical speaker enclosures....A full range speaker finds itself radiating into half space at the upper frequencies but radiating into full space at lower frequencies. As a result, there is a gradual shift of -6dB from the highs to the lows. This is what is called the "6 dB baffle step" or the enclosure’s "diffraction loss"." Please visit http://www.trueaudio.com/st_diff1.htm for more information. Now the 6dB part actually varies with design and isn't given as a standard or fixed value to shoot for. 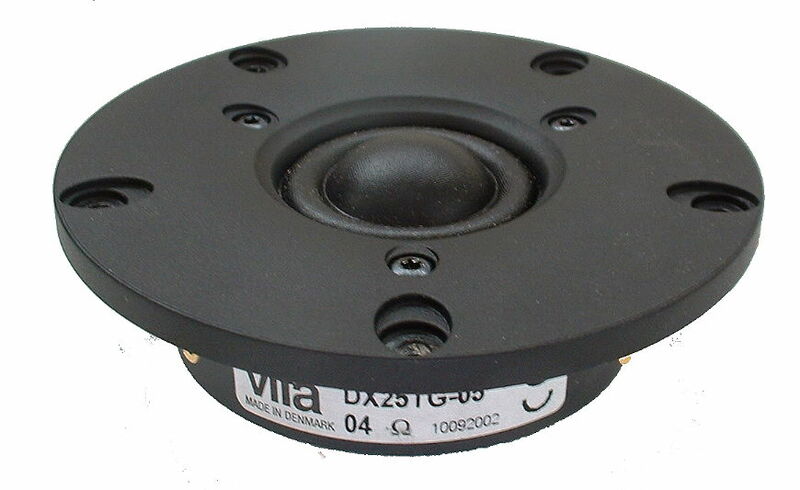 In real world applications, depending mostly on the final placement of the speakers in the listening room, this value will vary from 3dB to 6dB. 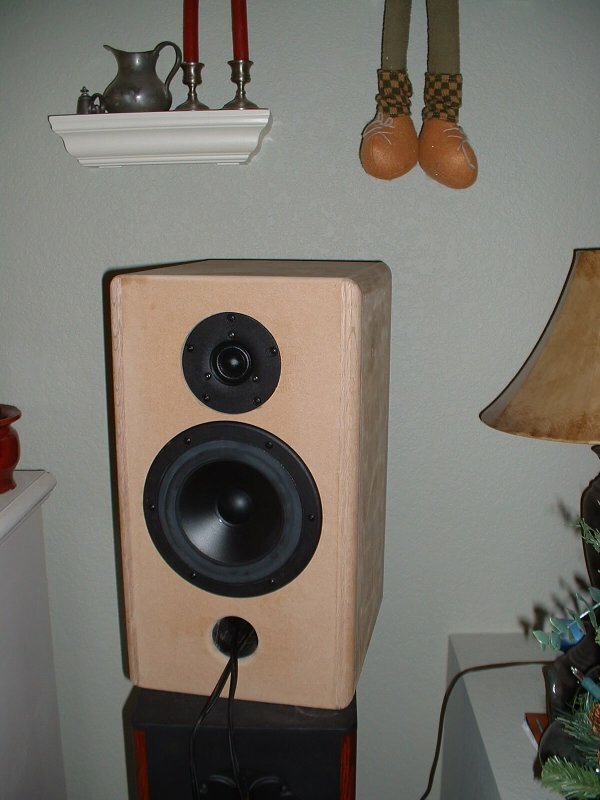 I told Bob that these speakers would be placed on stands 24" high, 3-4 feet from either wall on each side and 1 foot from the wall behind them. I also had drawn up CAD drawings which showed the width of the front baffle as well as the driver's mounting locations. So he came up with two separate crossover designs, each allowing for a different amount of diffraction losses. I still haven't decided which one to finally go with. Please click here if you wish to see all the of the documentation he sent me on these two designs. 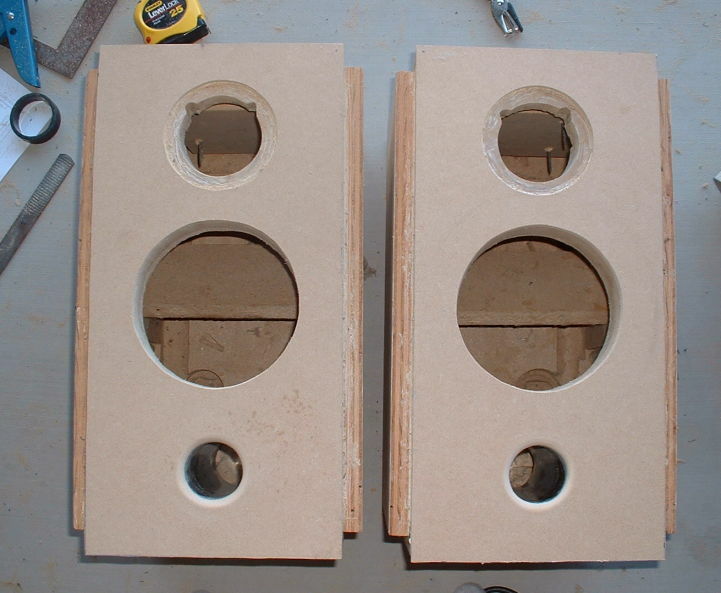 It is very thorough and very informative to anyone designing a two-way speaker system. Crossover filter frequency must fall between 1.8 KHz and 2.5 KHz. Linkwitz-Riley (L-R) filter type with 24 dB/octave target filter functions. 12 dB/octave filter on the woofer with an 18dB/octave filter on the tweeter. 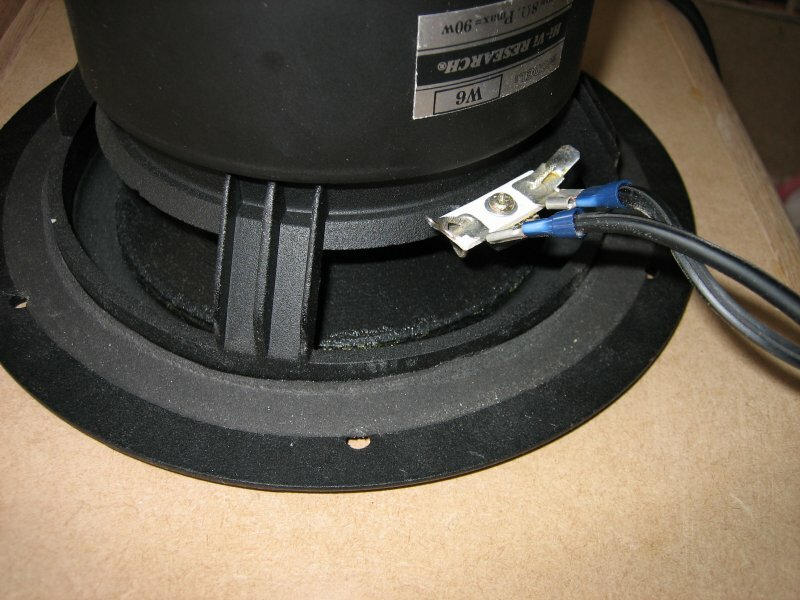 Proper attenuation of tweeter to match woofer designed as a fixed circuit. I believe that was all I had to start. Bob insisted on doing the diffraction losses in addition, and I said go for it. He obviously knows more than me on the subject, so who was I to argue? And with that, he came up with the crossover for my Monitor W690 speakers. Now the reason I wanted a 12 dB filter on the woofer and an 18 dB on the tweeter is all because of good 'ole Vance Dickason. After absolutely consuming (reading) his 6th edition of the LDC, I picked up on a few new things. 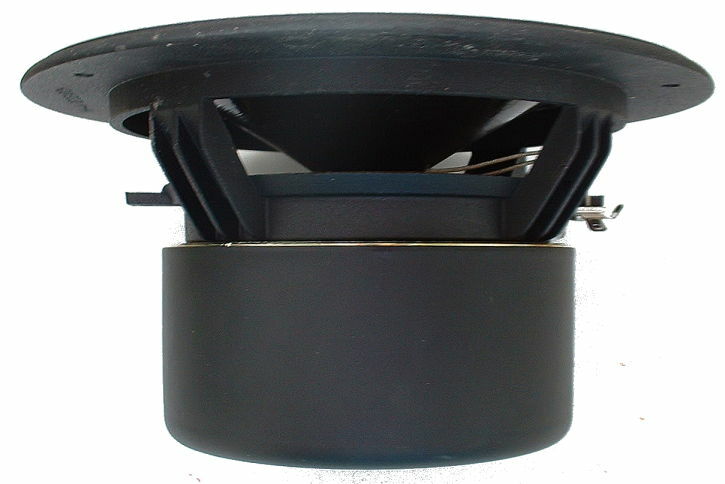 For example the polar tilt of a conventional speaker system throws the sound either up or down 15 degrees. This is because the acoustic centers of the two drivers are not on the same plane. They are vertically offset by anywhere from 0.5" to 2.5". 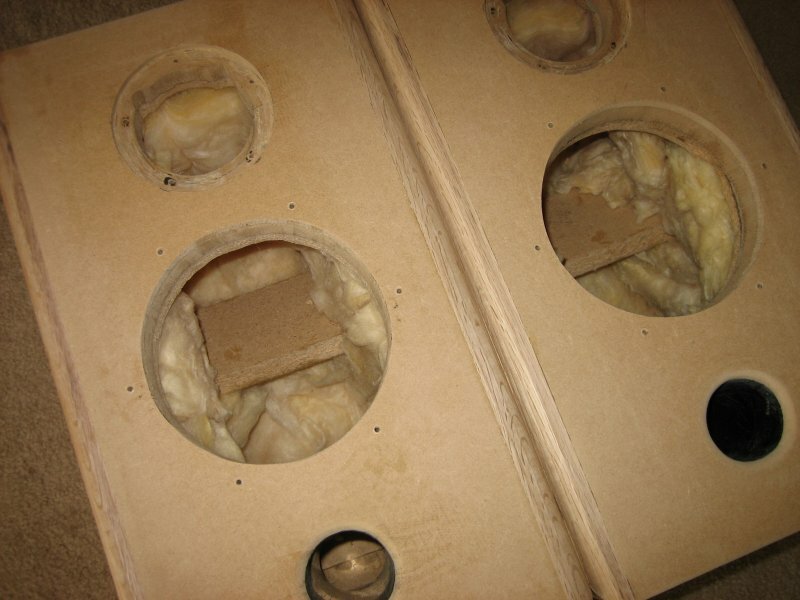 One way to combat this is to build the enclosure with the tweeter mounted back from the woofer so as to align the centers of their voice coils on the same vertical plane. This wasn't an option for me because I already had 75% of the enclosure complete. There was no way to make the physical separation. 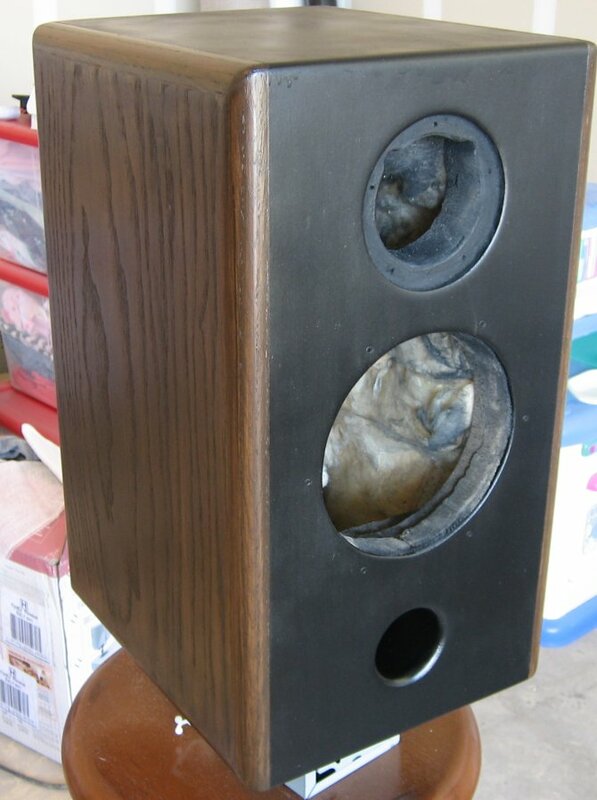 Besides, I'm not a big fan of the way those particular speaker's look. Second option is to tilt the whole speaker back 15 degrees, wire the tweeter so it throws the sound down 15 degrees and bingo, I've got a decent polar response once again. Still a no-go, because I personally like to have my speakers sitting flat pointing right at me. It just looks correct to me. Now for the third option, which is what I went for. You put a 2nd order filter on the woofer and a 3rd order filter on the tweeter and the difference in phase between the two actually compensate for the interdriver time delay, or, the difference in distance between the radiating source of the tweeter and the woofer. To take a quote from the LDC regarding this matter, "The network topography that works for 95% of all two-way designs you will ever encounter is shown in Fig. 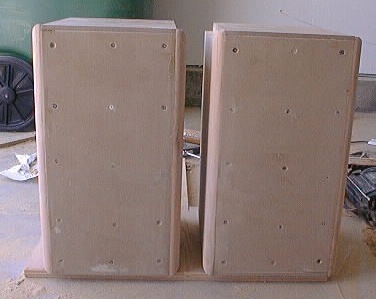 12.11, a second order filter on the woofer and a third order topography on the tweeter. This allows the computer optimization of fourth-order L-R high-pass and low-pass targets for both drivers. However, depending upon the interdriver time delay...these slopes never end up being symmetrical." He goes on to talk about Loudspeaker Recipes, and how in that book he discusses how to achieve flat summation of non-coincident drivers (drivers mounted on the same vertical place as we've been talking about). 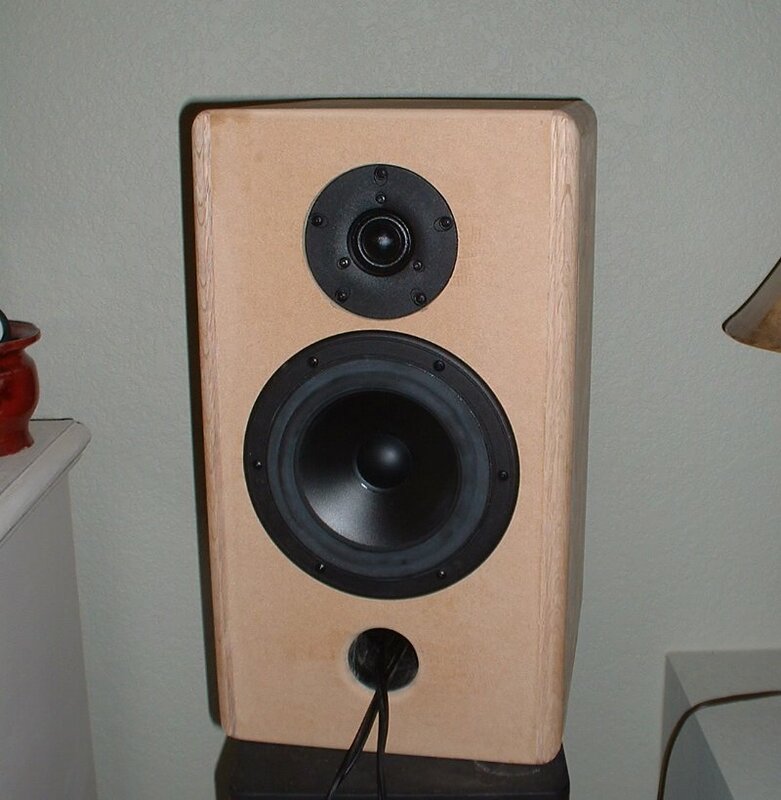 The he restates, "However, generally speaking, you end up with a shallower slope on the woofer and a fourth-order target slope on the tweeter...This asymmetrical slope actually compensates for the interdriver time delay and results in flat summation." So there you have it from the mouth of he who knows all. 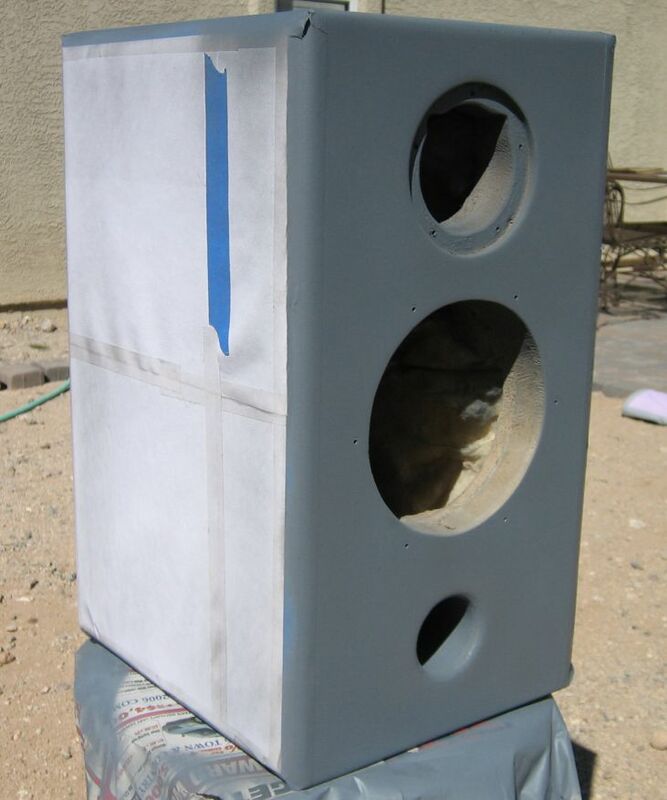 I've always wondered how some speakers costing thousands of dollars could have flat front baffles and sound awesome while others had recessed tweeters and also sound awesome. It's all about the crossover! You'll notice that in Bob's design, the polar response pattern shown at the end of the page confirms this. There is very little radiation tilt and the response it almost completely symmetrical. Now of course this graph is calculated and not measured and is based upon a guestimated 20 mm driver offset by Bob. By simply looking at each driver, I feel that this is a very good assumption and will stick with it. Okay that's it for today. I'll get more details up as progress is made. In the meantime, check out my Swans M3 page.